And information about consultants' performances should be shared better. 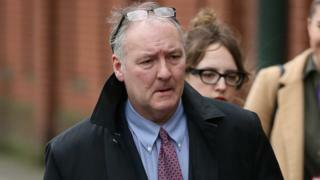 Prof Derek Alderson, president of the Royal College of Surgeons, said surgeons were "deeply shocked" by the case of Ian Paterson, who was found guilty of 17 counts of wounding with intent. An independent inquiry into the breast surgeon's conduct has heard evidence from more than 150 patients, with more still coming forward. Prof Alderson said the case highlighted the need for "an urgent review of how we assure safety standards in the independent sector". "There is no doubt that Ian Paterson was a rogue individual. That said, the entire healthcare sector must do more to prevent someone like him from ever causing harm again. "This starts with being able to collect and analyse good quality patient safety and outcomes data," he said. "There must be stronger oversight and protection for patients, regardless of whether they have their operation in an NHS hospital or in the independent sector." Currently, the private or independent sector, does not have to publish data on how many and what procedures have been carried out - unlike the NHS. The private sector has also not contributed to the majority of national clinical audits that collect data on care outcomes, including cancer ones - although it does register data on all replacement joints. "However, further work is needed to allow the sector to participate in the full range of NHS data sets and clinical audits and it is now vital that all those involved in better aligning NHS and independent sector data maintain the momentum," it said. Prof Ted Baker, chief inspector of hospitals at the CQC, said it would continue to hold all providers of healthcare to the same standards of quality and safety, "regardless of how they are funded". "All independent providers are required to notify CQC of any serious incident that takes place in their services. "That information is used alongside intelligence gathered from other sources such as feedback from patients and their families, clinical audits and relevant performance data. "Together this information helps us to determine where and when to inspect and identify where action is needed by providers to improve care," Prof Baker said.